My game of 2016 is a bit of a cheat as it's re-hash of a 14-year-old game that has been given new life thanks to PSVR. That game being Rez Infinite. It was, is and shall remain my favourite VR game I have played this year and I have enjoyed quite a few! It demonstrates how far-reaching and advanced the original game was thanks to its import into a VR realm. 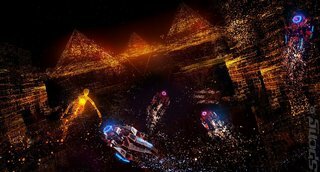 The act of pointing ones head to target enemies makes Rez Infinite so much easier to play and enjoy. It also adds to the immersion, which is quite something considering the original game was pretty immersive in its self. I liked it so much I even busted out my Dreamcast and played the original and thanks to my experience with Infinite I improved my skills with it. Honourable mentions go to Thumper for being such an entrancing yet exhausting game and TitanFall 2 for reinvigorating my interest in the FPS genre and thus giving me hope for the next generation of them to come. Chris O'Regan is the host of The Sausage Factory, a podcast which takes a deep dive into games development, and a regular contributor to SPOnG.